The editors here at ThruHikeFlorida.com are photographers, and we have carried DSLRs on multiple thru-hikes. From the astonishment and disbelief at the sight of our big cameras we assume most hikers just want to take basic snapshots. And there is nothing wrong with that. The lenses, sensors, and software on smartphones is incredible, and you can take beautiful pictures that capture your journey with your phone. In fact, we recommend not taking a separate camera, that way you save weight. Smartphones have a serious disadvantage, however. Most are not waterproof and the very wet Florida Trail provides daily opportunities to drop your phone into the water. That is much more likely to happen if you have it out constantly to take pictures. Plus, the crystal clear waters of Big Cypress and artesian springs will temp you to take photographs under water. Ultralite waterproof covers are available of course, like the Loksak or a simple Ziploc bag for that matter, but pictures shot through a plastic bag aren't that great. If You Want a Camera, What Does That Say About You? For you, a dedicated camera is an upgrade from a smartphone, so you want a camera that does everything a smartphone can do and more. You want pictures at higher resolution and quality than a smartphone. You want to take a lot of pictures, not the occasional quick shot. You want to take pictures all the time — not just when there is a vista. You want to shoot in the low light of a campfire, at night, in the rain, underwater, and down on the ground next to bugs and flowers. With this in mind, we went on a hunt for digital cameras that met those requirements while remaining as lightweight as possible. Is GoPro Best for Thru-Hiking? image quality is not an upgrade from a smartphone, particularly in low light. Without an LCD screen or viewfinder there is no way to accurately aim your shot or know what is in the frame. You shoot blind the whole time, aiming vaguely at your subject and hoping for the best. despite everything above, it is still incredibly expensive — $350-$400 new! the real kicker is, despite having virtually no features, our GoPro Hero3 still weighs 7 ounces with its battery, waterproof housing, and a Gorillapod. GoPro's real strength is its system of mounts and attachments that allow someone to shoot video from virtually anywhere — the end of a surfboard, inside your mouth, or even the back of an eagle. While that's great, there isn't much need for that on a thru-hike. 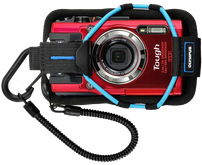 If you want a compact digital camera that is rugged, lightweight, waterproof and loaded with features that make it worth the money, we recommend one of the cameras below. Our personal favorite is the Canon Rebel SL1. At just 14 ounces (body only), it is the lightest DSLR on the market (with an ASP-C sensor), yet still has all the features of a larger, heavier DSLR. We carried SL1s on our Florida Trail and PCT thru-hikes, and were pleasantly surprised that it stood up to the humidity of Florida, the heat of the Mojave, and the cold of the High Sierras. Since the SL1 is not waterproof however, we stuffed the cameras into dry bags when the weather turned. Just a little bit heavier than the SL1 is Nikon's D5500, at 14.72oz (body only). Pentax is the only manufacturer offering weather-sealed DSLRs and their lightest model to date is the K-50, at 1lb 6.9oz (body only, no lens attached). That is 8.9 ounces more than the lightest DSLR on the market (see below), but its weather-sealing protects the camera from moisture and dust, as well as temperatures from 14-104°. For a DSLR to be useful and functional on a thru-hike, it needs to be both accessible without taking your backpack off, and stored securely with the lens attached while you hike. 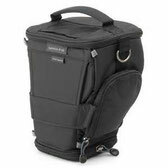 We use the Think Tank "digital holster" attached to the front of our pack. The camera rests in the shooting position with the lens attached until we pull it out and begin shooting. The digital holsters come in different sizes (numbered 5-50) for different camera and lens combinations, and the bottom can be extended to accommodate longer lenses. Our Canon SL1 with a 100-300mm lens fits easily into the #10 holster, which weighs 10.6oz without the unnecessary shoulder strap. Think Tank sells a harness system for attaching the digital holster v2.0 to a backpack. It weighs 11oz, however. That was too much for us, so we took key lanyards that cost a dollar each and attached four of them to the holster. At the other end we threaded the lanyard's nylon webbing through the straps on our shoulder and hip belts. All together the four lanyards weigh less than an ounce, and cost us just $4. The system is adjustable and has remained secure over 2400 miles of hiking. The total weight of your camera system will depend on the lens you bring more than the camera. Lenses are determined by the kind of shots you want to take. If you are most interested in landscapes, you'll want a wide angle lens, but if your interest is wildlife, a telephoto will be needed, and telephoto lens are heavier. Photographer Ken Rockwell argues that image stabilization in modern digital cameras make tripods unnecessary. We disagree, as do many other photographers. Many shots, especially in landscape photography, require long shutter speeds only possible with a tripod. When you search for an ultra-light tripod for backpacking, however, there isn't much out there. Hiking, backpacking, and photography forums often tout the merits of full-size tripods costing between 300 and 500 dollars. For all that money you would expect them to be made of titanium and weigh 6 ounces, but most of them weigh 3-4 pounds! That might be acceptable for a day-hike out to a shooting location, but is unacceptable weight on a thru-hike. The most lightweight, reasonably priced, quality tripod we have found so far is Dolica's TX570B150. It comes in two models, the DS, which has an integrated monopod, and the SL, which does not. The DS sells for $80, and the SL is slightly cheaper at $70. Dolica's website claims both models weigh 2lbs 8oz, but on our scale the DS is actually 2lbs 11.5oz. This is a truly professional tripod, and we love the ball head and quick release plate, which are rock solid. The whole thing is aluminum, with a few steel screws and such, so when we first picked it up, what struck us was how light it could have been. If Dolica wanted to make a truly ultra-light tripod for nature photographers, they could keep this design, which is already light, but use titanium instead of aluminum. If they did, the whole thing could weigh in at a single pound.